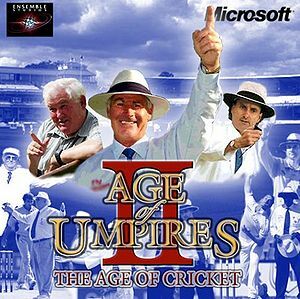 Age of Umpires is a highly successful RPG/Strategy video game series by Microsoft and Unsemble Studios. 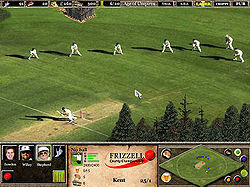 In it, the player takes control of a team of Umpires with the primary aim of officiating cricket matches. The game has fallen out of popularity in India, where crowds prefer to see computers get decisions wrong instead. Ball tampering/eating must be dealt with adequately. The game's appeal stretches further than simply umpiring cricket matches. Your ageing officials are constantly in need of supplies, which must be gathered from various parts of the ground. This is where the successful player excels: trips to the pavilion at the end of each over must be swift, as such tasks as collecting six packs of Scrumpy Jack and emptying your bladder must be performed at regular intervals and against the clock. Failure to do so results in crowd disturbances and unless the unruly mob and their crap can be avoided, a game over situation results. Players must also avoid attacks by the cunning Osama. Other, impromptu tasks must be completed within set amounts of time: adjusting the sight screen every two balls, avoiding low flying pigeons and seagulls (common at seaside grounds such as Brighton), and fetching your hat when a gust of wind takes it into an adjacent field. Lunch and Tea breaks offer salvation and a chance to refill your health meter with pickle sandwiches and fairy cakes. The player must, however, be wary of flying objects thrown by dismissed batsmen on the way to and from the changing rooms. Similar problems are faced during rain breaks, when the player must constantly inspect the playing surface and avoid being crushed by the hordes of journalists baying for your blood. Beginning out in the Wigan and District league, the player must work their way up the cricketing ranks from Sunday League umpire to International Test level. Graduating to each higher level brings new challenges: dealing with Shahid Afridi's pitch tampering or a barrage of Muttiah Muralitharan no-balls await the Test umpire. There is also the added problem of Geoff Boycott, who is a constant danger to the pitch, bouncing balls on bowlers' run ups and widening any cracks which have appeared by sticking his car keys in them. Troublemakers can, however, be dealt with by being driven over with the pitch roller, or dispatched by a discreet knee to the lunchbox. The most successful game in the series to date is AOU2:Age of Cricket. Boasting improved graphics and game engine, this offered new features unique to the second game, such as the streaker elements, where naked supporters invade the playing area and must be chased off before play can continue. The player was also now able to select from a wider range of umpires past and present, and the new 'create-a-git' option allowed for more customisation than ever before. Perhaps the greatest improvement of all, however, was the introduction of an Overseas bank account, to which bungs, another all new feature, could be paid. Underhand deals such as halting play for bad light at 1:50pm, inadvertently 'missing' LBW decisions or placing balls in dangerously random positions during practice sessions in return for monetary rewards were now an essential for game progress. Amounting large wads of cash allowed for increased pension money, and a retirement fund which needed to reach £3,000 before the game's final secrets were unlocked. David Shepherd's incredibly mobile limbs and slimline figure allow him to evade attacks and/or oncoming traffic with ease. However he is slightly vulnerable when the score totals 111, 222, 333 etc. due to him temporarily losing the use of his left leg. Billy Bowden has an unusual method of dismissing batsmen: instead of using index finger to point to pavilion, he has been known to give batsmen the v-sign send-off. Naturally, this too has its problems. Dickie Bird, an unlockable character, has incredible Superman-like vision. Therefore he is able to be 100% accurate when giving LBW decisions. Peter Willey is able to down forty-six pints in the space of ten minutes, thus replacing lost health ten times more quickly than the average official. John Prescott is incredibly intelligent, and has potential to be a consistent official. However instead he usually decides to deck egg-tossing miscreants. Also has an increased pie devouring threshold. Seems to be extremely irritated after his loss of department at the recent elections, all copies of the game are being recalled because of the need to change John Prescott's behaviour. Pete Doherty an all round average umpire, but don't take your eye off him for too long because he's prone to snorting up the boundary. Darrell Hair is a respected and skilled official, but has a tendency to be biased against sub-continental sides. Game can be won using this umpire only when he receives $500,000 in bribe money. Also available on county mode where he is strangely biased against Asian players. Steve Bucknor has an extremely valuable special move called the 'slow death' whereby he takes an eternity to raise his finger, often waiting until just before the player chooses to save the game, causing it to crash on them. Hearing aid requires new batteries quite often. Rudi Koertzen is known for his excellent umpiring accuracy and knowledge but his character is over-coded and sometimes appears to be umpiring in (unusually) slow motion. This combined with his enormous height make him an easy target. His clammy whitened cheeks mean he has sun effect immunity in all countries (not just England). Will give 1 in 3 lbw's, especially if blatantly obvious.Most effective against the Indians whom he has single handedly(fingeredly) defeated. Mark Benson has a liking for Steve Bucknor's cause and his bucks. Wholesomely supported Stevie in his bid to finger-out the Indians. Also asks for timely umpiring tips and references from Australian captains like Ricky Ponting. Simon Taufel Easily gains double points for his freestylin on the Lords function room dancefloor however game can be abruptly ended due to arrest for looking like an accountant.Dreamt of becoming a cricketer as a youngster.To this day, he warms up with the players hoping for any last minute selection. Warning: The following text might contain spoilers. This makes the article more aerodynamic, and thus more maneuverable at high speeds. Take caution and carry a first-aid kit at all times if you don't know that Harry's butler knew all along, Beatrice is the Orphans' Mother, Professor Xavier lives, Spike Spiegel dies, Daisy runs over Myrtle, leading Wilson to kill Gatsby and then himself, Henry testifies against his best friend and goes into the Witness Protection Program, Lowrie fulfills the wish list, but dies, Earl fakes his death again to get out of the relationship, which backfires, and then drives her to fake her own death as revenge, and Soylent Green is PEOPLE!!! Age of Umpires II in game screenshot. 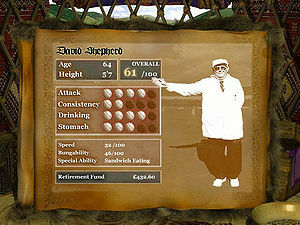 David Shepherd's stats. Completing the game on all three difficulty settings (sober, drunk and wasted) rewards the player with a variety of bonus aspects. These are listed as follows. First completion: Dickie Bird unlocked: now playable and edible. Second completion: Metal box available: offers extra protection. Third completion: Aussie mode unlocked: can you complete the ultimate challenge of umpiring a drug-fuelled Horny Shane Warne whilst under the influence of thirteen cans of Foster's? Secret mission completion: Jellied Eels available: confusion. £3,000 retirement fund: Retire to Prestatyn to wear cardigans and eat jam butties for the remainder of the game. Find the tunnel from the Lord's Tavern which leads to the secret alcohol storage room in Freddie Flintoff's basement. Microsoft has now confirmed that a third game in the AOU series is in development. The Age of Old Gits is set to include all new game modes, an experience points system (based on pints devoured) and an 'OAP-friendly' online gaming feature. It is not known at this point whether Mick Jagger will make a guest appearance as a guitar-playing 12th man. 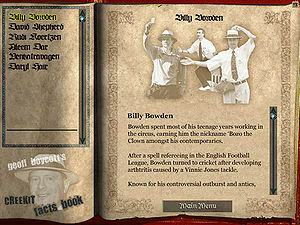 Billy Bowden and Victor Meldrew are set to give their backing to the game, which was due for release in early 2007 but has been delayed until the programmers can get more spare time to code the game. This article was chosen as the Best Illustrated Article in the April 2006 Poo Lit Surprise writing competition.